The best protein bar should have enough protein to meet your dietary goals while avoiding unhealthy levels of sugar and fat. After consulting doctors and nutritionists, and taste-testing over 40 finalists to figure out which bars we’d actually want to eat, we landed on our top picks: tasty, healthy options for a post-workout refuel, for tiding you through lunch on a busy day, or for a health-conscious snack. A surprising number of “protein bars” contain the same amount of protein you’d get from a serving of chips or a bag of microwave popcorn — in other words, not much at all. If you’re going out of your way to eat a protein bar, you probably want something more substantial. So we only considered bars in which protein accounted for 30% or more of total calories. Why 30%? Because for an “average” person, the USDA suggests that 10-35% of your diet come from protein. A protein bar on the high end of this scale helps balance out meals that aren’t as well-rounded. In addition to aiding digestion, fiber also helps you feel full. “Fiber contributes to satiety and it’s a really underappreciated dietary component,” says Emily Braaten, MS, RD, LD. “Most Americans aren’t getting enough.” The USDA recommends 14 grams of fiber per 1,000 calories consumed — or at least 1.4 percent of total calories. We cut any protein bar that didn’t meet that benchmark. Too many net carbs, on the other hand, can cause blood sugar spikes and lead to increased hunger. “Ideally, I like to see no more than 15 grams of net carbs,” says Dr. Joe Feuerstein, MD and associate professor of clinical medicine at Columbia University. When it comes to protein bars, what looks good on paper can all too easily end up tasting like sidewalk chalk. We wanted something that was nutritionally balanced and also delicious. So we rounded up our 44 finalists for a taste test. And perhaps unsurprisingly, most of them received a massive thumbs-down from our testers. In fact, the adjectives “weird,” “bad,” “artificial,” and “bitter” popped up again and again in our testing notes. Two protein bars received comparisons to dog food. But a handful were actually tasty, and those became our top picks. A whopping 21 g of protein per bar, though the high calorie and fat count makes this pick less suited to casual snacking. If you’re trying to build muscle, you need protein — and a lot of it. Both Auslander and Feuerstein agreed that people who are bodybuilding or highly active should look for bars with at least 20 grams of protein. The OhYeah! Nutrition ONE Bar delivers, with 21 grams, all from dairy sources. The ONE Bar’s other standout feature is its high fiber content — 36% of the average person’s recommended daily intake — which, combined with all that protein, makes it very filling. Plenty of high-protein bars provide roughly 20 grams of protein, so what really sets the OhYeah! ONE Bar apart is taste. We tried its Almond Bliss flavor, which testers reported was “like an Almond Joy, but less intense,” with a “very subtle taste” and a soft, chewable consistency. Others agreed, praising its coconut-y flavor and the fact that it wasn’t overwhelmingly sweet. 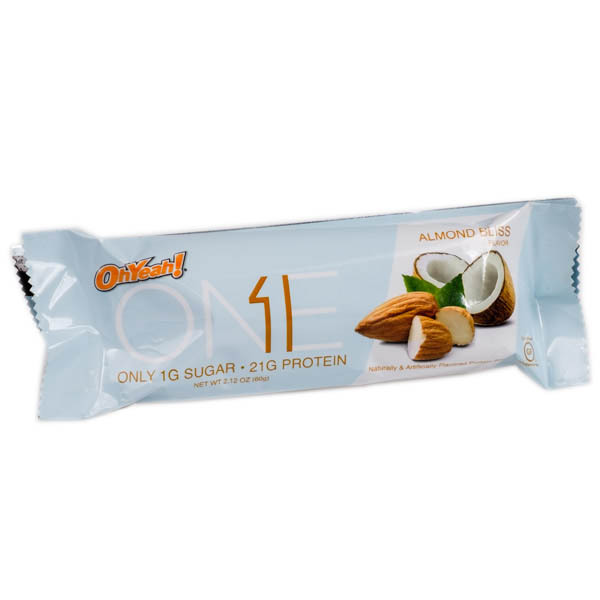 If you don’t like almond and coconut, the ONE bar also comes in 13 other flavors, including Cookies & Creme, Salted Caramel, and Maple Glazed Donut. One tradeoff to the ONE Bar’s high-protein yumminess is its fat and calorie content: the highest among our finalists. Each bar contains about 35% of your recommended intake of saturated fat — almost as much as a real Almond Joy. The 230 calories in each bar are also by far the most out of any finalist. This is why we recommend this protein bar for those regularly hitting the gym. The clear winner of our taste test, this bar delivers 10 g of protein in just 150 calories. 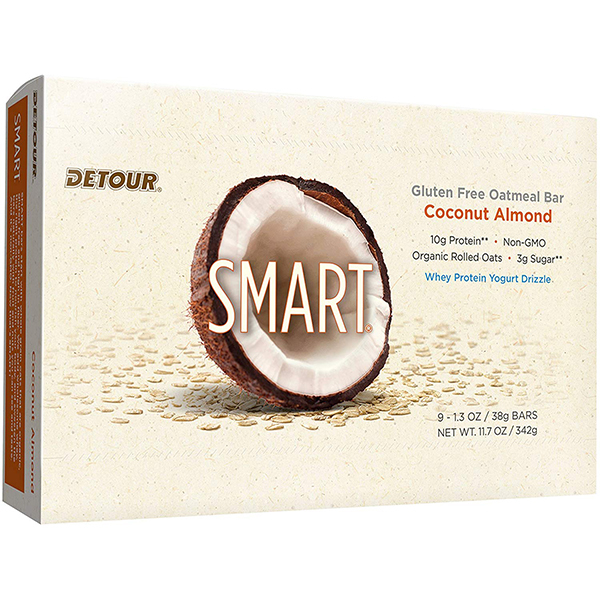 The Detour SMART Oatmeal Bar (Coconut Almond) was the hands-down favorite of our testing team, reminding us of a soft-baked granola bar (for a truly soft-baked taste, you can even warm it up in the microwave). Our testers all agreed that this bar tasted “natural” and “healthy.” The first item in the ingredients list is gluten-free organic rolled oats, followed by a dairy-based blend of proteins. We discovered that the Coconut Almond flavor included both grated coconut and almond chunks, which added to the feeling that we were eating something a little better for us than soy protein crisps covered in frosting. There are four other flavors too: Apple Cinnamon, Blueberry, Cookie Dough, and Peanut Butter Chocolate. This little bar is also easy on the sugar and fat, with the lowest calorie-count of any of our top picks. There are just 150 calories and 3 grams of sugar in each, making it a truly lean, yet protein-rich snack. This bar is smaller than the other protein bars we tested, at just 38 grams (compared to an average of 47 grams among our top picks) which is why we dubbed it “Best for Snacking.” But it still manages to pack a respectable 10 grams of protein, more than many other bars on the market, and equal to the chunkier Orgain bar, our top vegan pick. If you’re looking for a satisfying snack, we highly recommend it. A tradeoff to the SMART bar’s small size is its relatively light fiber content. It offers just 3 grams of dietary fiber — enough for a substantial snack, but still only 12% of your recommended daily intake, making it not great as a meal replacement. A nutritionally balanced bar with 15 grams of protein, 170 calories, and a cookie-like texture. If you prefer a cookie-like texture and a not-so-sweet flavor, the FitMiss Delight Bar is also worth a look. With 15 grams of protein in a modest 170-calorie bar, it’s a great option to see you through when you don’t have time for a full meal. An impressive 12 grams of fiber also goes a long way toward making the FitMiss Delight a realistic meal replacement, given that fiber is key to feeling full. This bar quadruples the Detour SMART Bar’s paltry 3 grams of fiber. We enjoyed the FitMiss Delight bar’s cookie-like consistency — sweet enough that you might feel like you’ve eaten a dessert, rather than a meal or a protein bar. If you enjoy sweet treats for breakfast, these bars are likely to hit the spot — especially paired with a cup of coffee. This bar is 170 calories — a lower calorie count than Berndt’s recommended range — but otherwise, it does a decent job of hitting her recommended nutrient levels. It’s heavy on both protein (15 grams) and fiber (12 grams), which should help you feel full longer. “Pair your bar with yogurt or a piece of fruit if you find yourself feeling hungry,” Berndt also suggested. The only one of our top picks to rely solely on plant-based protein sources, with 10 grams per bar. 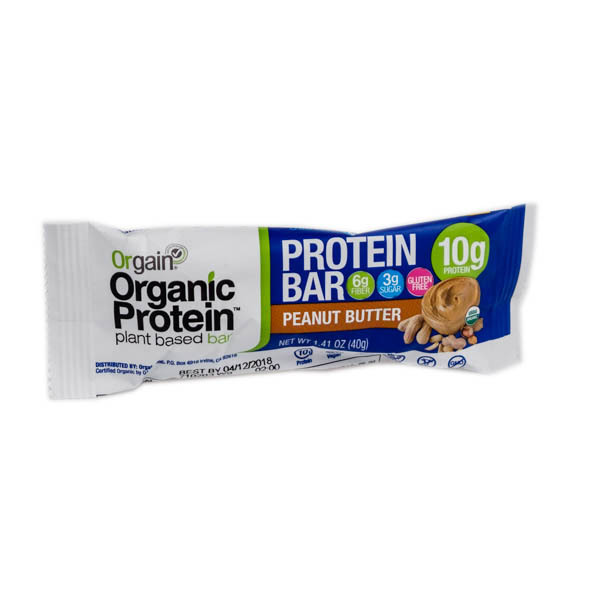 If you’re looking for a vegan-friendly option, the Orgain Organic Protein Bar was the only one of our top picks to use plant-based protein, providing 10 grams per 140-calorie bar. It’s also soy-free and gluten-free, although it does contain nuts. This is a standout feature in the protein world, where most bars rely on dairy-based calcium caseinate or whey protein isolate. All of our testers noticed that the Orgain Organic Protein Bar was the only bar in our top 10 to include both sweet and savory flavors — the peanut butter bar had a salty, almost smoky taste — a plus for people who don’t want their protein bars to resemble candy or cake. This protein bar felt like eating actual food (though it’s also available in the more “dessert-y” flavors of Peanut Butter Chocolate Chunk and Chocolate Chip Cookie Dough). The Orgain bar’s brown rice protein, pea protein, and chia seeds are all certified organic by the U.S. Department of Agriculture (USDA) — a distinction that goes beyond the dietary wholesomeness of the bar itself. Brands that carry the USDA Organic label must demonstrate that they are protecting natural resources, conserving biodiversity, and using only approved substances in their production. Our taste testers had mixed reactions to the Orgain bar. The Peanut Butter flavor we tested was sticky and chewy, and some of our testers got peanut chunks stuck in their teeth. But if you’re focused primarily on health and natural ingredients, the Orgain Organic Protein Bar is the way to go. Are you looking to bulk up for a competition, or just delay hunger pangs for a few hours at your desk? Kick off your morning with a protein-boosted breakfast, or pack some energy for a day on the trail? Different bars are designed for different purposes (as we noted in our top picks), so knowing yours is the first step in choosing the one that best fits your needs. Some protein bars remind us of candy, while others taste more like a healthy, wholesome snack. And while most are sweet, there are a handful of yummy savory ones on the market, too (just look at the Orgain Organic bar). It’s also likely you’ll want a few flavor options so you can alternate bars, too, especially if you’re having one every day. Sugar alcohols — sorbitol, mannitol, xylitol, and more — sweeten products while keeping the sugar count low. They’re great if you’re cutting calories, but they can sometimes cause gas, bloating, or gastrointestinal discomfort. Our bodies cannot completely absorb sugar alcohols, which means rather than passing into the bloodstream, they travel through the gastrointestinal tract. Once there, they can ferment, causing abdominal cramping, flatulence, and diarrhea. “A lot of people experience bloating after eating a protein bar, and this is why,” added Feuerstein. If you’re considering a protein bar with a lot of sugar alcohols, try buying just one first to make sure there aren’t any unexpected gurgles in your stomach, before committing to that 20-pack. Is one source of protein better than others? The short answer is no. We couldn’t find a single best protein source — they all seem to be absorbed similarly by your body. Just make sure the type you opt for is compatible with any dietary restrictions. Most protein bars use calcium, milk, and whey proteins from cows, but common dairy-free and vegan choices include soy protein, plus protein from peas and brown rice. Are protein bars healthier than real food? No. All of our experts recommended natural protein sources over protein bars, especially if you’re using protein bars as a meal replacement. “Why are you replacing meals with a bar, anyway?” asked Auslander. “Dieticians always like food first!” She also suggested that you consider nut butter, cheese, yogurt, or cottage cheese after a workout, instead of always going straight for the protein bar.